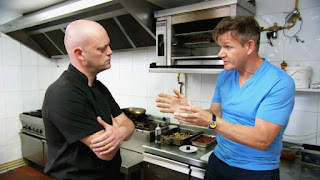 In this Kitchen Nightmares episode, Chef Gordon Ramsay visits La Granada Divino in Gaucin, Spain, the restaurant has only been open 8 weeks and is losing £4,000 a week. Gordon arrives and finds the owners drinking on a rooftop terrace. Gordon orders a fish cake and kebab, he also orders a terrine, risotto, lentil salad and steak. The pate tastes of nothing, the risotto arrives 40 minutes later and is under cooked, the salad is terrible and the steak is tough. Gordon meets Chef Neil who likes fiddling with knives and seems to take Gordon's criticism quite well. Gordon arrives for a dinner service, Neil has two cooks to help but they seem to be only preparing salads. Neil is doing everything and begins to cut corners to be able to send food out. Gina is drinking wine on the terrace and two hours later only half of the customers have had their food. Neil has lost control of the kitchen and customers say they won't return. Gordon meets with the owners who admit that they didn't do any checks on Neil so Gordon calls some contacts who reveal he was never executive chef. Gordon challenges Milan to run front of house and Gina to cook in the kitchen. Neil struggles to communicate and Milan struggles in the front of house. Gordon is forced to apologise as food takes two hours to reach the customers. Gina and Milan finally see Neil's struggles, Gordon tells them they have expected too much of him and they stand at the front of the restaurant discussing replacing Neil. Gordon suggests a roast chicken special to take some pressure off of the kitchen. For the evening service, Gordon asks Neil to delegate tasks to help take pressure off and the waitresses are pushing the chicken special. Neil leaves the kitchen to speak to diners in the restaurant and the customers enjoy the food. Milan, Gina and Gordon take to the streets with samples to promote the restaurant and a new menu is devised featuring Spanish inspired food. Gordon has fixed the lift to improve the service and take some pressure off of the wait staff and suggests that Emily is made the manager of the restaurant which is supported by the owners. For relaunch night, Gordon reveals that he has invited the top, local food critic to dine with them this evening. Communication is good and the sharing plates are taking the pressure off in the kitchen and are going down well with the customers. Neil starts to slip, Gordon tries to pull him back but they sell out of sharing platters and Neil has to serve individual dishes. Neil slips into bad habits, the communication disappears and the cook tries to send out food before it is ready. Gordon gives them a pep talk and the communication recovers with great food leaving the kitchen. The food critic brands it the best restaurant in Gaucin and he is particularly impressed with the lamb chops. After Gordon left they were taking £5,000 a week and Gina and Milan had taken a step back from the restaurant allowing the staff to run the restaurant. Reviews since Gordon's visit appear to be very positive, with compliments on the service, food and presentation of the food on Trip Advisor and they appear to have kept the concept of sharing platters that Gordon introduced. La Granada Divino closed in September 2015, as owners Milan and Gina retired from the restaurant trade, they posted the below on their website. We would like to Thank you all for dining at La Granada Divino over the past couple of years!! La Granada Divino has certainly had an amazing couple of years with some notable highlights including featuring on Gordon Ramsay's Costa Del Sol Kitchen Nightmares watched on National TV as far away as South Africa, Australia and the USA. Our kitchen has two great chefs from the UK and South Africa with out Front of House waitresses. The restaurant hosted some fantastic events ranging from Halloween to Art Exhibitions, the Andalusia Porsche club, Birthdays and Anniversaries and customers from all over the world. We hope everyone enjoyed the La Granada Divino dining experience that was also complimented by mouthwatering food and delicious wines that was all reflected by an excellent Trip Advisor rating. We regret to announce that the owners, Milan and Gina, are now retiring from the restaurant trade and the restaurant in now closed. All of us at La Granada Divino want to thank you all for supporting us and hopefully the restaurant will open under new owners soon. The La Granada Divino Team"
La Granada Divino aired on 07 October 2014, the episode was filmed in June 2013 and is Costa Del Nightmares episode 3. I cannot express enough to any "Baby Boomers" on either side of the pond that if they harbor any restaurant dreams to watch the entire KM library. You have worked hard for many years to save for your retirement and that is not an easy thing. Do you really want to take all of your life's hard work and throw it in the bin? I will be more than happy to take your money as I am a single dad with a teenage son. Seriously, take your portfolio and your pension and go travelling. In the best of scenarios, 7 out of 10 restaurants close within a year. You don't want or need that kind of stress at this time of your life. After working for The Man their whole life, it can be enticing to get to be the boss, and if they can afford to hire good management the hope is their staff runs the restaurant and they get the profits, like investing in a mutual funds. Of course the retired looking to become restaurateurs aren't looking to work hard and long hours, but they expect that as owner of a popular restaurant they will be popular themselves and can hook their friends up with reservations, chef's table, a place to host events (Art Exhibits, Porsche Club meetings), etc.